Jason Reeves is a fantastic artist who with the the help of a mentor came out of the tragedy of Hurricane Katrina to become a very successful indie comic creator. His signature book, ONENATION, can be described as “Superman meets the Hurt Locker”, which sounds very intriguing. I’m looking forward to reading it (yes dear reader, I can’t read everything). Here’s the interview. First, who are you, where are you from and where do you live now? What was the first comic that you read and/or bought? It was two actually, Spider-man 341 of the ‘Powerless’ story arc and Robin (Tim Drake) #1. Can’t remember the first I’ve read but It may have been one of the Uncanny X-Men Classics. I know that you’re an artist, did these early comics inspire you to become one? If so, was there one book in particular where it made you realize you can do this too? Definitely. I’ve been drawing since I was 3yrs. old but seeing the drawing sequentially, telling stories really influenced me. It wasn’t until I saw Erik Larsen’s Spidey with those weird poses, and Robin’s kung-fu training in france did I know this is want I wanted to do. Superheroes are kinda my muse lol. Yeah, I can tell by your work. I understand that you graduated from school at a young age. Tell me a little bit about your education. It was only like half a year and only because I started school a little earlier that the other kids. My birthday is Dec. 31 so I had to start school at 4yrs. I graduated from the New Orleans Center for Creative Arts. New Orleans is filled with a lot of great artists and some of them taught there. That’s where I got my ‘formal’ training…they weren’t very fond of comic art at the time though. I almost flunked out my first year lol. Man, you dont know how many comic artist tell me the same thing about their formal education. Let’s move on and talk about your comic work. What was the first project that you contributed to? And what did you learn from the experience? My first gig was a comic for a small publisher called Qew Publishing. I was the penciller on a comic about Warring clans of werewolves called ‘Blood & Silver’. It was cool because it was my 1st San Diego Comicon I was determined to come home with work and I kinda did. But for a first timer the grind of a-page-a-day was rough. At the time I was still working a day job mind you. It also didn’t help that that a week and a half later Hurricane Katrina blew through town. Once I and my family was safe I had to basically learn to discipline myself to get on that page-a-day schedule. Wow, I didn’t know you went through Katrina. How do you think that experience influenced your artwork and gave you the strength to move to LA? I had to push through it. It was a really interesting time for me, bittersweet. Because of the huge amount of transition involved. That year at comicon I had met a guy that I didn’t know at the time would become a great friend and my mentor, Lee Moyer. Shoutout to Lee man! He’s an illustrator as well out of Portland. We met in the registration line of all places and he eyed my and another buddy going throughout portfolios. Good thing he poked his nose in out convo though because it literally changed my life. He gave us a few tips and we parted ways but kept in touch. When Katrina happened, after all the confusion died down he offered to let me crash at his place in Portland.While there he showed me the ropes in the freelance illustration game. I’m not sure I could’ve made as much progress at home on my own. It just shows how a kind act can really change a person. I’m grateful. That’s awesome man. Did you form 133Art while in Portland or was that something that came along later? It was the beginning stages of 133art, yeah. I shudder at the thought of133art.com 1.0. and the first logo, you should’ve seen it…then again I’m glad you didn’t lol. I was mostly doing fantasy illustration, cards, t-shirts. I did a little work on the game Dreamblade for Wizards of the Coast, stuff like that all the time waiting to get my foot in the door to the comic book industry. Was ONENATION always meant to be the flagship title for your company? No actually. I had this post-apocalyptic story called Dust I was developing but it just didn’t come together for me. Time wasn’t right I guess. I really wanted to come up with something that would speak to all the things I loved in comics, superheroes, big movie-style action, the 90′s lol. So I came up with ONENATION to get all that out of my system. I like your concept for ONENATION, give us a quick synopsis. 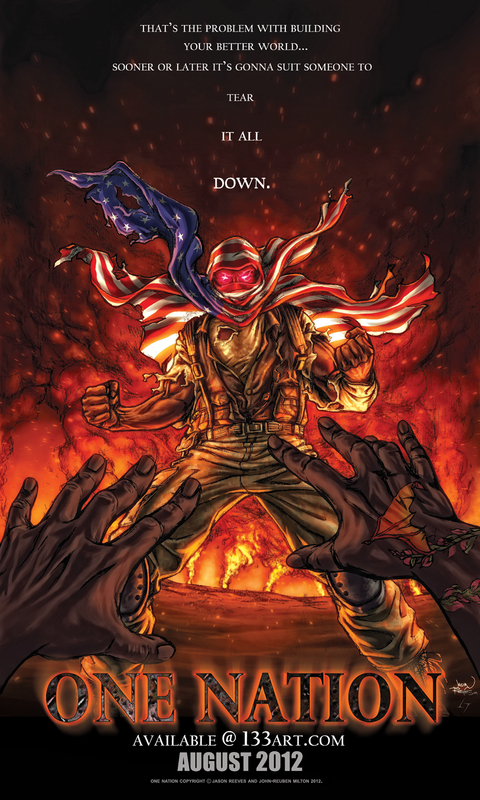 ONENATION is a five-issue limited series featuring the hero Paragon, the first superhuman the world has ever seen, whose idealistic views of doing good for mankind is challenged when the reality of changing the world hits. Paragon; along with a rising generation of superhumans called Keramats, find the trappings of being a superheroes ill-fitting when it comes to the larger role of saving the world…from itself. 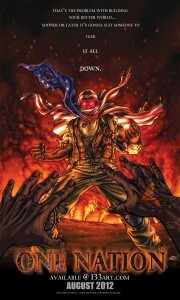 Somebody recently described it as “Superman meets The Hurt Locker”. Cool. I know you’ve also done some work for Arcana as well as Urban Style Comics. How is it working with Andre Batts and Dreadlocks? I want to be like Andre and UrbanStyle when I grow up. It was one of the best jobs working on Dreadlocks. Andre had a cool story in the Dreadlocks: Deceased Ones. Dreads comes up against Lilitu for the soul of his friend and almost gets taken down! Andre let me run with my crazy manga influenced ideas and we came up with a great book. I’m biased because i drew it but I love the idea of an ultra powered ‘soul-self’ Dreadlocks. Dreadlocks is a high spot for me. Yeah, Andre and I have discussed doing a crossover with my book, Force Galaxia. I look forward to working with him. Well, I could chat with you for a while, however time is running short. Lastly, where can the fans find OneNation and contact you for any work or commissions? You too man. Take it easy. This entry was posted in Columns and tagged 133Art, Andre Batts, Andre Owens, Cosmic Mutiny, Dreadlocks, Erik Larsen, Force Galaxia, Hurricane Katrina, jason reeves, Lee Moyer, New Orleans Center for Creative Arts, Oew Publishin, onenation, Urban Style Comics. Bookmark the permalink. Follow any comments here with the RSS feed for this post. Post a comment or leave a trackback: Trackback URL.